SHOPPING INFORMATION, TERMS AND CONDITIONS. Please carefully read these terms and conditions before using Norra’s Web Shop. By using our Web Shop and placing orders on the Web Shop, you agree to abide by the Terms and Conditions. A placement of an online order indicates your acceptance of these Terms & Conditions. This website is operated by Norra Outdoor AB, Organization number 559169-2651, hereon referred to as “Norra”, “we” and “us”. We reserves the full right to modify or alter these terms and conditions at any time. We do our most to ensure that the information we provide to our customers regarding our products is as correct as possible. Nonetheless, we cannot be held liable for any printing/spelling errors or errors in images that may occur and prevent us from delivering in accordance with the information published on our web site www.norraoutdoor.com, our marketing material or other means. We reserve the right to cancel your order or parts of your order if the product is out of stock or held for resale. If a product is out of stock, you will be notified and may also receive information at the same time of other products that we can offer as replacement. You will be given the option to accept our new offer with the changes we have specified, or to cancel your order. We may change the prices of products listed on the site at any time and without any notice but such changes will not apply to products in respect of which you have been sent a dispatch confirmation. Without limiting your rights as a consumer under the laws of your country, these terms and conditions as well as all claims or disputes arising hereof and of using this website or shopping in the webshop shall be governed by Swedish Law. Any controversy, dispute or claim arising out of or in connection with these terms and conditions, or the breach thereof shall be determined by Swedish court. We are still working on our payment options for country's outside of the EU. If your country does not have an available payment option yet, please contact us at info@norraoutdoor.com, and we do our best to add your country. More countries will be added in the future. Payment by card is made in accordance with current rules for online payment in Sweden and the EU. We use Svea Ekonomis / Webpays host PCI-DSS-certified card payment solution. We accept the following cards: Visa, MasterCard. The money is reserved in your account at the time of the order. All transactions are sent via Secure Sockets Layer (SSL), securely encrypted. No card numbers are saved. We use the latest security technology for credit card payments online 3D-Secure - a standard made by VISA and MasterCard with the intention of, in a secure way, validating the consumer when purchasing online. When paying by invoice, we cooperate with Svea Ekonomi AB. All invoices are handled by Svea Ekonomi AB. Through our cooperation with Svea Ekonomi AB you can sign an account credit agreement and thus be able to pay off your purchase. Choose the credit period by ticking the campaign option that suits you best. The purchase can always be paid in full at any time, before the due date. Please enter your shipping address in our checkout to find your price. If your country is not available as an destination yet, please contact us at info@norraoutdoor.com, and we do our best to add your country. More countries will be added in the future. Shipping within Sweden is 59 SEK for 1 pair of Ljung Outdoor Pants, or 99 SEK for 2 or more pair of pants. Shipping within Sweden is 99 SEK for 1 pair of Ljung Outdoor Pants, or 149 SEK for 2 or more pair of pants. 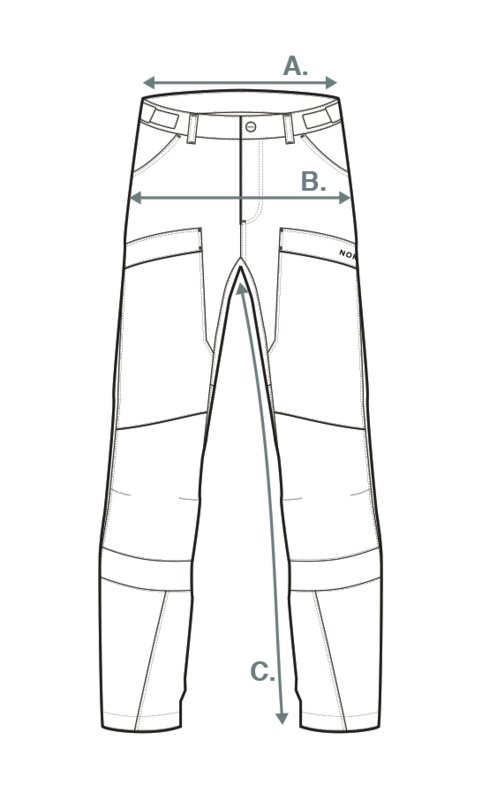 Shipping within Sweden is 149 SEK for 1 pair of Ljung Outdoor Pants, or 199 SEK for 2 or more pair of pants. For all orders from European residents, prices include Swedish VAT at 25 %. All countries within the European Union are shipped to on a DDP (Delivery Duty Paid) basis, meaning that taxes and duties are included in the price at checkout. We expect delivery of the Ljung Outdoor Pants in the end of May 2019, from our production partner. The delivery to you will be in June. We are currently taking pre-orders with delivery in June. The price listed for pre-orders is only temporary and will change as we stop accepting pre-orders. Once you have place your pre-order will you receive a confirmation email and when your order is ready to be shipped in June will you receive a shipment email with tracking number. Norra products are fully warranted against defects in materials and workmanship for three years from the purchase date stated on your receipt. During this period, we are fixing all faults that fall under the statutory warranty obligation. The warranty does not cover damages caused by misuse, normal wear or damages caused by external impacts. In the case of an authorized claim, the product is either repaired or replaced, the right to choose alternative may be limited by legal restriction. To submit a warranty claim, please e-mail info@norraoutdoor.com. After the contact we send a prepaid shipping label.